Bake French bread as directed on can; cool completely. Cut loaf into 12 slices; set aside. Heat oven to 400°F. Line cookie sheet with foil. Arrange bacon slices, side by side, on cookie sheet. Bake 12 to 16 minutes or until golden brown and crisp. Remove bacon from cookie sheet to paper towels to drain, patting top of bacon with additional paper towels. Meanwhile, in toaster, toast bread slices until lightly toasted; set aside. 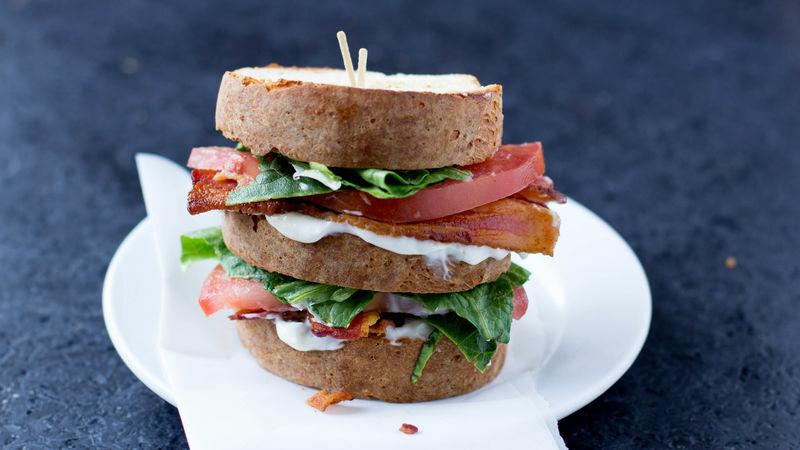 To assemble each sandwich, place 1 bread slice on plate; spread with thin layer of mayonnaise. Break 1 bacon slice in half; place both halves on bread. Top with half tomato slice and half leaf of lettuce. Place second bread slice on top; spread with mayonnaise. Repeat with bacon, tomato and lettuce. Top with third bread slice. Since this is a tall sandwich, it’s best to stick a toothpick in it to keep the layers together as you’re eating, but don’t forget to remove it! Cutting lettuce with a knife can cause it to bruise. Instead, tear the lettuce leaves to the correct size for the bread.